There are plenty of different resources available for sales management and sales performance, but few that offer transparency, accountability, recognition for meeting goals, motivation for your team, and development opportunities quite like Ambition. Today we’re joined by Jeremy Boudinet, the Director of Marketing at Ambition and a key player in the AAISP. Jeremy describes how Ambition can be used by your sales team at every point in the pipeline, from connecting with prospect all the way to closing the sale. Sales Managers take note, this is one episode you won’t want to miss! Marylou: Hello everyone, it’s Marylou Tyler. Today, I have a guest that you guys who are sales managers are going to love, Jeremy. He is all about leadership. He’s all about sales management and sales performance. Even if you’re a business developer, you’re going to want to listen but if you’re a sale manager, especially, take copious notes and you probably want to relisten to this podcast because it’s all about you today. Jeremy is the director of marketing for a company called Ambition located in the Tennessee area. He’s also been involved in the AAISP chapter, the Tennessee local chapter for coming on two years now. I’ll let Jeremy tell you all of his other accolades but he and I met at an AAISP trade show in Boston. No, I met one of your folks in Boston and then from there they introduce me to you. 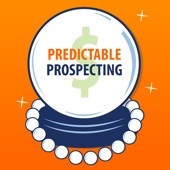 Jeremy and I have put together a four part webinar series, all on pretty much the last three or four chapters of Predictable Prospecting, my book. We have that out there now if you want to listen, sit back, relax, listen, but we’re also thinking about putting together some actionable work books to get you guys sort of filling out these action plans of implementing sales performance management. Jeremy represents a company that has a tool for that. So without further ado, I will introduce Jeremy and have him tell us more about his background. Jeremy, welcome. Jeremy: Thanks, Marylou. Absolute pleasure to be working with you again. I feel like it’s [00:01:55], the rapport coming naturally here. The hours we’ve put in the last quarter with the great webinar series we did. Thank you for having me on and I guess, to give a quick background about myself, I joined Ambition in May of 2014. We are a sales performance management platform that basically tailors to any front office team, takes all of your data sources, syncs them together, lets you benchmark and broadcast performance goals with your boards in real time, right to reps in their dashboards. In Sales Force, we’re stand alone and in TV as well that your whole team can see right there in your office. It’s been an exciting last two years with these guys. I’ve watched the product grow a great deal, to learn from a product that just scored employee performance, our fantasy football, if you will, in real time to become this full blown suite of features that a manager can use now to really manage your entire Sales Force. The greater [00:03:10] to using ads, PricewaterhouseCoopers, UPS, ChowNow, Outreach, you can go to ambition.com and check out user driven walk through where we have people like ChowNow, VP of Sales, go through each of our features and showing how he uses Ambition to run his SDR team and account executive team, account management team and all that good stuff. I’m very passionate about the mission we have. I grew up in a family that has been lifelong DVD sales, modality sales for a number of major companies and my brother happens to be a fat account executive himself, I’m the CFO and we made six figure deals the last three of four years now. Very much a cool mission here to be a part of and that is people like you, part of people like you who really sort of help lead the vanguard of things to those managers that’s exciting and it’s a loose conversation to all response, if I had to chat with you today. Marylou: Well, good. I tell you, being a process person, I used to say to people I have my eyes glazed over when it comes to the people side of things because I was really more focused on the process itself and relying on the numbers and how the numbers would accentuate and amplify what was actually happening, where things were getting stuck, where the gunk was. But as I worked more and more with clients, I realize that it’s really a triad of people, process and then with technology now. It’s amazing what you can accomplish if you have the right tools and you deploy the tool the way, as we talked about on the webinar, more looking at the function of your sales process and your sales methodology rather than the form and the tool itself. Tell us Jeremy, what’s changed? You said now Ambition goes the whole way but let’s talk about each area because people who listen on this podcast are business developers, there are sales executives who specialize in closing business, there’s account managers. Let’s start at the top of the funnel, marketing reps who take usually the inbound leads and then business development reps. Tell us what the challenges were and are so that people have the level of awareness around where they might be falling short and how a product like yours or how to think about using and leveraging technology like yours in order to create more of a predictable stream of opportunities. Jeremy: Sure thing. I like where you’re starting off bringing this that way, just the funnel aspects. I can speak to this first hand as someone who’s responsible for basically all inbound lead gen and demand gen with Ambition. What we’re seeing with the top of the funnel and inbound marketing BDRs, account based SDR, all that sort of stuff is there’s now a very strong metric driven quota based on this approach now for your inbound team and your lead generation team. All of a sudden now, we’re focusing a lot more on bench marketing and in creating a predictability around lead generation. That’s kind of the basic taking the quota approach for account executives, like you guys have closed this much revenue in this quarter and applying it now to BDRs and SDRs and whatever you want to call them and saying, “Alright, you guys have to now establish this many new qualified leads this quarter, have this many meetings set, all that stuff, create a very [00:07:13] pipeline for new business coming in that the team can close.” It’s on a larger level, it’s very good, I think it’s a healthy move forward because it helps align sales and marketing much more forward and both teams are sort of under the gun if you will. It helps marketing too, you want people in marketing who have that sales mentality. I’m one of these people where I’d like kiddie school myself. All that matters are the found unders. You have more keying off. As a lot salespeople like to think, arts and craft on the side. That’s a very key aspect of the new vanguard here and whether you’re doing an inbound lead sort of thing, or maybe you have a very transactional feel and more responsible bringing in inbound leads and that can be quickly closed, usually within a year or two. Or you have a very outbound lead generation strategy where you have BDRs going out and aggressively attacking accounts. It’s same thing, you need numbers around but there’s need to figure out ways to create a pipeline, but that can still very easily help you grow your business as a feature. Marylou: The other thing that I see a lot still like with respective benchmarks. What’s nice about benchmarks is it’s a baseline for each of you to start but you’re going to be crafting your own benchmark depending on, as Jeremy was saying, if you’re inbound only, if you’re outbound, if you’re blended, if you do account based selling. There might be different sales functions that are assigned to different accounts. In the olden days, we used to call them the core accounts which would be the top 20. The people that you know you would like as customers, they’re going to have a different type of touch sequence and you have extended universe which is like everybody else but they also are pretty good size. They’re the whales and you’re going after them differently. You have hyper personalization of email, voice mails. You also have data driven personalization but the beauty of all this is that there are benchmark for all of these to get started so you’re not 11th hour 59th minute questioning yourself, “Where am relative to where I should be?” You at least have something to look forward to. That’s what I love about the tools. Jeremy: 100%, and it actually goes to a [00:09:50], who is a guy you met at Boston. We just wrote of big article why the [00:09:56] lead the frontline for new person for management. Funny, we invoked The Progress Principle which is a great book, I encourage everyone to read, that basically breaks down sort of what separates high performing teams from low performing teams in business. It’s based on a certain amount of data and daily journal entries from all these employees that these authors got involved in the analysis. The number one catalyst they found for creating the right kind of employment mentality for driving high performance is setting clear goals. Number one thing, stand by progress principle, stand by practitioners, stand by people like you, [00:10:43], all these other guys, it’s the same thing. It’s a goal based, number based approach having that no longer just applied to your closers but to your entire front office if you will so that everyone is aligned around them. Marylou: Yeah, and they are numbers and they are starting point because as you start tracking, and starting to get into the rhythm of the lag of what the touch counts are, the actual rhythm or cadence of do I need to do three phone calls before I get in the door with the decision maker or where am I at? You’re developing your own kind of secret sauce that you’re going to be using to create a predictable framework. That’s really what it’s all about. Not all channels would be predictable but the ones that are, the ones that are going to be more accurate on the forecast, they’re typically going to be the larger accounts because those are the ones in a universe of accounts that probably have a high likelihood of closing with higher revenues. This is all giving you that arsenal, those tools, all the cool things. If you’re definitely a goal oriented person, like most of us in sales are, and even technical, we’re all goal oriented, if you have that in front of you, it’s a beautiful thing. I just think it’s great that you can see where you are. When I was a kid, I used to draw a thermometer on my wall board because I was training for something. I think it was like the American Council of Fitness when I was a kid. To throw a softball 150 feet, is that right? I can’t remember how far that was but I used to mark on this thermometer in red every time I inched up further to my goal. For someone like me, this is just like the best thing ever to have. Jeremy: Yes. When you’re competing or when you have a goal in front of you, you perform better. I’ll say this, I was never the most athletically adept. Growing up, I loved sports and I played sports, especially basketball, year round. It’s funny, I was captain of one team, Marylou, and that was our competitive riding team. I remember winning the gold medal. We won [00:13:08] championship in our school’s senior year. It was interesting just having a goal in a competition. You’re just going to perform better because you’re going to have like, “This is competition, you have the goal in front of you. You have the reward that’s in front of you and you have your pride on the line. Marylou: Right, exactly. You can imagine with the energy in BDR, a business development organization, since remember, we‘re working top of funnels, we have a lot more records that are going through our pipeline and there’s a naturally higher energy of working and we do things in blocks, we do a lot of phone calls and we do them consistently and serially. Having this type of software, having this ability to track where we’re at relative to a goal is really important. Let’s cross over, we’ve got those opportunities figured out. We have created an environment that’s fun, that people are constantly helping each other on a team, making our goals. We have these ops that are going to be handled over to the quota carrying people. What does that look like in a sales performance management tool? Jeremy: Great question. For times that deal with the sales performance management tool is to take things like the standard things you’re measuring which is probably deals and revenue. But then, adding a bunch of context around it so that you can see here’s how I’m trending compared to the past performance. Here’s how I’m trending versus my peers. You can see things like here’s the account executives who are maybe doing the least amount of calls but getting to close more deals, operating more efficiently. Great example here, one of our clients, I won’t divulge the company, but high level SAAS company, very big name. They’re guys that are responsible for closing deals and they actually attacked the HR level. A lot of them were told this is basically where you’re supposed to be trying to close, at this level. What one of the managers found, because of our tool advertently, was that one of the highest performers was able to close more deals doing less calls because they have a thing called productivity quadrant where you can see the x factors for activity calls, emails, whatever. The Y axis is your goal acquisition; its revenue, its deals. There’s one person who was an amazing outlier, they were very high up in the top left quadrant. High goal acquisition like, “Hey, can I ask that person what are you doing that’s so [00:16:15]?” The person is like, “To be honest, I’ve been going straight to the C-level bypassing the director of HR and so the into the CFL.” They started doing more now to surround that and they end up actually changing their paradigm for that. Sales performance management, if you’ve been using the platform correctly and there’s other platforms out there that are really good, like inside squared stuff like that. They can really tell you how your process is doing but what you can do is help you. You have a process doing by giving your data perspective under individual people. Your task is going to performance extremely well, they can tell you this person is doing extremely well, they’re very low or very high calls to deal ratio. It’s very low calls to deal ratio. They tend to close things very quickly. So then, you can go, “What are you doing that makes you so effective over the phone?” That person can then relay that information to the rest of the team. Effective, especially at the account executive level where there’s lot more skill if you will or arts in some ways to closing deals. You can really start to get sense of what is that artistic or what is that strategy that is working particularly well amongst your AEs and how can you maybe start to codify it and really cross your entire teamwork. Does that make sense? Marylou: Yeah. In fact, I was having a discussion this morning with a colleague of ours about how many times we’ve each heard how unique the sales process is, the customers are, the clients are, the prospects are. The answer that I always say is, “I’m sure they are.” But somewhere in there, there’s a behavior that we can tap into that’s consistent. If we can tap into that consistency of behavior and like you say codify it or I call it bottle it up. Like the secret sauce again, if we can actually get that thing embedded into the framework as something that’s actionable for us, we’re going to be much more successful. But it’s hard to spot those things if you don’t have an analysis tool to be able to look at and slice and dice things in various different ways. That whole what if analysis for the entire pipeline is what we thrive on. It’s easier to do at top of funnel because we have so many records we’re working with. There’s a statistical relevance in the amount of touches that we do. But like you said, to find that outlier to say, “You know what? We’re at the wrong level. We need to go up a level and just think about what that impacts.” If all of your marketing is written for the HR person and now you’ve got to revamp for the CFO, but you can close more business, that’s going to be an initiative that’ll be bubbling up to the top. Jeremy: Yes, absolutely. I’ll give you one more example, a very different example. This is the same thing, one of our client. Reliance partner is actually here in Tennessee. One of the top ten fastest growing logistics company in the country. What they did, they were looking at who their top performers were. What they start out doing was a test where they had people, they’re calling, they’re third party logistics, they’re calling all over the country. They had a guy from the North East who was dealing there. Where have you worked the North East? He was killing it with all the North East accounts. I thought maybe this is a thing where having reps who are from a different area, we have a southern guy from Alabama and [00:20:06] focus him, his account, in the Rural South East. And then we have somebody who’s MidWest who’s from Chicago who’s one of our account executives. We’re going to have him dealing with [00:20:20] and Chicago, Illinois, Ohio, whatever. Lo and behold, it actually worked. They end up codifying it across their whole company now which is crazy but they start out with them looking at here’s the high performers, we’re going to put this person with these people and we’re able to measure previous performance when that person is not targeting a certain region versus perform faster, we switch to this region and we can then pair them because we have a tool, there’s a [00:20:53] tool but that’s built specifically for sales. We can very easily see this person is doing better compared to the control which is everybody else. There is outlier and then extend it, same things happenings, get the results across the board. Yes, it’s funny how the stuff like that, territory, front end, which level to attack. That’s where Sales Force Managers, especially on the A level can really become effective. Marylou: That’s great. Just one story about an equivalent to that at the top of funnel again is emails. We did a lot of testing with how to write a cold email or an introductory email. The Midwest versus the Coast versus Germany versus U.K versus France. Once we changed the language and the sentiment, especially here in the U.S, East Coast people, we found for this particular company, was more apt to be told what to do and then Midwest was more apt to respond to a request because they’re more polite here in the Midwest, in Des Moines, Iowa. But it’s just amazing how your tool allows you to do that. We have to rely on the numbers to test and see if we change one word and we’re looking at behavioral indexes and sentiment data bases and things to give us what we need. But that’s so powerful. Now we’ve got the rep, he/she has closed the business, now we’ve got the closed account from the account executive and we have clients. Can sales performance management tools be used once we have a client in place? Now, let me just preface that by saying clients for us, on top of funnel, through the referral engine are extremely important. Loyalty, engagement, and those types of things really help us. What do you say about sales performance management? Jeremy: We’ve had a couple of studies, it’s actually very fascinating. Account management, one of the key things I think that self performance management is you can loop in account management and have them on the same page with your sales team, have them synchronize. One of the ways you can do that is by using a platform like Ambition which incentivizes certain behaviors that you found to be more effective that you want your account managers doing more. You want your account managers calling your current accounts as opposed to emailing them, check in or to renew, or upsell. One of the ways to use Ambition is a benchmark and weight after calls is a great example of this. [00:23:54] weight calls more heavily than emails or any other activity for that person’s ambition score on the account management team would rise much more dramatically if they were calling accounts as opposed to emailing them. Another key aspect of a Sales Force management is directing this layer to Ambition, we have TVs which basically can provide real time notification when somebody hits a performance goal. It could be anyone who’s on Ambition, the goal could be where the manager wants to set up. It could be talk to 20 churn accounts today. It could be close $10,000 in revenue today. It could be set five meetings today for SDRs. What that does is that helps account managers stay synced in with the rest of the team and they have a better understanding. This is a broader picture, here’s how what I’m doing, here’s why calling somebody impacts things better. It just measures their insights on what is more effective. I could say call is more effective than email, you’re able to trace it to the tracking calls, emails, and then maybe client renewals, client referrals or whatever. The behavior or goals are with your current clients and it’s pretty powerful. It can be used a number of different ways based on how you work with your clients. For us, we look for client renewals and greater adoption among certain clients of Ambition. That’s one way we measure success, how many times we talk to somebody versus how many times a day are they adding feeds or something like that. It’s a pretty powerful thing and I’m a huge believer in having – I think account management is really sort of the next level now starting to see of scaling a business team development because we have happy clients, it’s going to be able to create a loop that’s much more easy for you to scale your team and your BDRs from leveraging your marketing to your account executives can leverage it. I think having the visibility, the synchronicity and the recognition around your account manager’s behavior is really big three things that Sales Force management tool like Ambition can help us. Marylou: That’s wonderful. I think what I heard that really resonates with me is that whole team aspect, the collaboration. It’s a feedback loop that is so important. We get our customer testimonials, our endorsements, our stories, our referrals, our references. It all comes from the client base and we need to love them more in order to be able to grow the top of funnel. I think that that goes without saying and sometimes we get caught in this whole net new, net new, net new that we forget that these are clients who believe in us, trust us, took our hand. Now we need to treat them as such. If we have mechanisms in place that allow us to continue that no trust in like scenario, that’s going to win more business for us in the future and make our lives easier on the front lines, the stuff that I do in being able to start conversations with people we don’t know. Jeremy: Yeah, 100%. That’s literally our operating mantra here at Ambition. That’s why we’re profitable. I think another key aspect to that too is account managers, you have to remember, they don’t have this huge compensation packages that account executives have, they don’t have like a lot of BDRs have, the incentives, I do this, I get to go and become an account executive and have this huge compensation package. What you can really do to help account managers, a lot of them have a little more than list aspects of the job and are dealing sometimes with frustrated clients or they’re solving problems and they can have a more favor, they’re there just a lot of the same frustrations that sales can have. By having them feel the same recognition, having them feel like they’re part of the whole team as one and they’re not siloed over here as this name was saying to those people. You can really help their day to day motivation and positivity levels. We’ve heard a lot of that, it’s straight from the mouth of our clients. Their managers have really made that a concern and have seen really good results from it. Marylou: Wonderful. We’re at the top of our time to talk. We’ve gone over a little bit but I’m sure everybody was just bending into their earphones, leaning in with all this great information. How do we get a hold of you Jeremy if we want to learn more, know more, see more, try more, what do we do? Jeremy: To gain contact with me, you may email me jeremy.boudinet@ambition.com. You’ll find my LinkedIn too. For Ambition, definitely recommend checking us out, ambition.com. You can also find us on Twitter, @ambitionsales. I’m pretty sure the blog, we’re pretty active, there’s all kind of stuff on there. There’s product information, there’s customer case studies, there’s stuff like the corporal webinar [00:29:47] that’s purely educational and informative. We’re always trying new stuff that’s really the bomb, it’s meant to help people. We’re not like Buzzfeed, quick data article, trying to get [00:30:00]. We try to do stuff that’s definitely helpful, whether you’re with Ambition or not and you’re a sales manager’s trying to keep up in a challenging way. Happy to help, contact us however you like and definitely check out the sales development accelerators. That’s our webinar series. Marylou: Yes. I will put all of your contact information in the show notes because Boudinet may not be like Smith to spell. I’ll get that all in there but I think a couple of things I wanted to wrap up with about that. It is all about education. A lot of you probably want to do your research ahead of time. The blog is really good for that, and it’s going to answer questions you didn’t even think to ask if you start reading the blog. I mean there’s a lot of “aha” moments for people like me who are so focused on process and forget about the other pieces that are really important in order to create a predictable pipeline with reduced lag and Jeremy is definitely reducing the lag and figuring out the magic formula and mojo in order to get a consistency in the pipeline. Take a look at that and I’ll put those notes. Jeremy, thank you so much for your time and energy and I loved working with you. It’s been fun. Jeremy: Absolutely Marylou, thank you and look forward to come out with you in 2017.